Jennifer Lyman, a long time public defender in the DC court system shares her perspective on the growth of mass incarceration during the Regan era and beyond. DPA radio crew: Owen Lyman-Schmidt, Leana Cabral, Dave Onion, Hakim Ali, Ana Martina. Art Factory collaborated with Decarcerate PA and PhillyCAM for six weeks to make three short stop-motion videos to help people realize the grand actuality of the Prison Industrial Complex.We interviewed Art factory folks you can enjoy their amazing clips and powerful poetry, tune in Decarcerate PA radio! DPA radio crew: Hakim Ali, Leana Cabral, Owen Lyman-Schmidt, Dave Onion, Ana Martina. The following three images were created to mark the begining of the school year and the state's continued divestment in public education at the same time as millions are being spent on prison construction. We are asking people to share these images on facebook, tumblr, and twitter. PSA Decarcerate PA radio show!!! 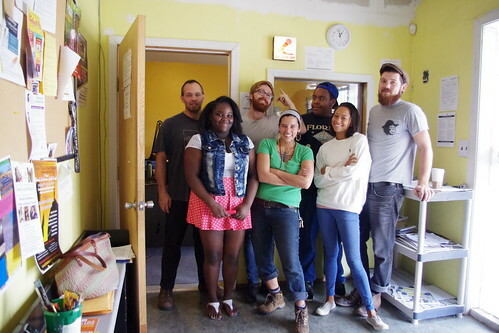 Listen to DecarceratePA radio broadcasting every Saturday at noon on WPEB 88.1 FM West Philadelphia community radio. Read more about PSA Decarcerate PA radio show!!! 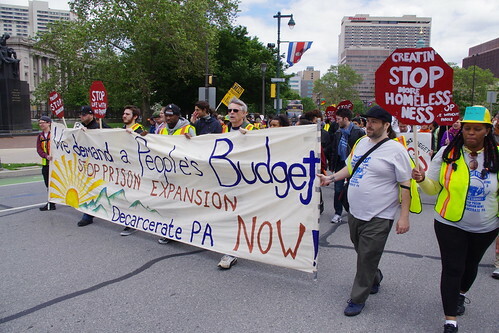 Approximately 50 people marched 113 miles from Philly to Harrisburg to demand a people's budget, not a prison budget. Why did they do it? Listen to the audio to hear from each marcher explain in their own words. Listen to this short 2:50 min audio piece of interviews with marchers on their way to Harrisburg who are demanding a People's Budget and a stop to prison expansion!! !